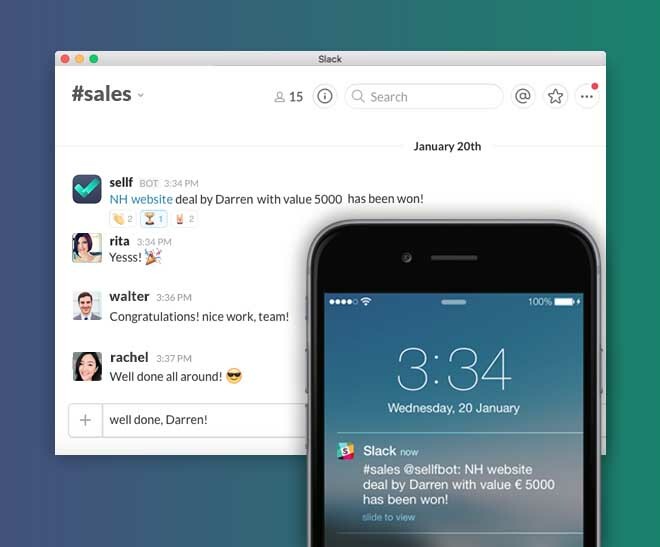 Sellf Accepted as First Fully Featured CRM and Sales Tracking App on Slack App Directory! Sellf > Sellf Accepted as First Fully Featured CRM and Sales Tracking App on Slack App Directory! We are proud to announce that Sellf is now available as the first fully featured and Sales Tracking App on the newly launched Slack App Directory! 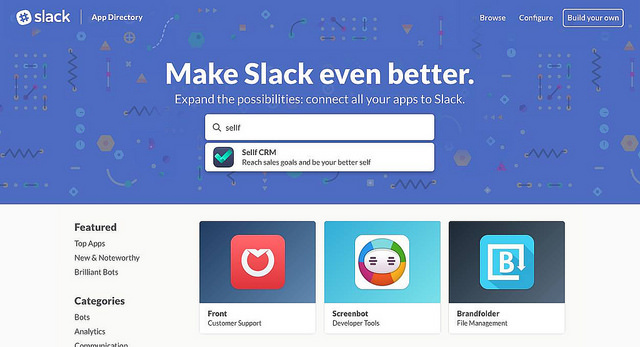 Few months ago, Slack introduced its “App Directory“, a marketplace where Slack users can choose among dozens of apps to add to their Slack channels, pulling in essential information or adding useful features to their team. You can find apps like Dropbox, Trello, Twitter and Skype to make your Slack space an open platform from where to access all the apps you use daily. And now, in the App Directory you can find Sellf as well, as the only complete CRM! First of all, you need to access this page and click “Add to Slack”. Then login into your Slack team account and select the channel you want to integrate with. Simply choose the Slack channel you want to integrate Sellf with, and our BOT will do the rest. Through the Slack integration, when one of the members of your company closes a deal, a “Sellf BOT” – i.e. a little robot who constantly looks at what happens within your Sellf account – will post a message in Slack so the whole team is notified and can “celebrate” the win. If you want to know more about BOTs, we covered the topic in this article. When a team member closes a deal, the Sellf BOT notifies it into your Slack channel to celebrate! “We see a huge potential in motivating employees to reach sales goals. Sharing sales goals with others and the progress towards them – via our Slack integration – will improve the chances for each member of the team to do better and at the end better contribute to the company success and benefit their individual career and success,” Diego concludes. Our team is already working on other ways to interact with Sellf from Slack. You will be able to add and manage deals, notes, to-dos and so on simply writing a text code on Slack. Curious? Try the integration now and follow us to be updated on the new features!